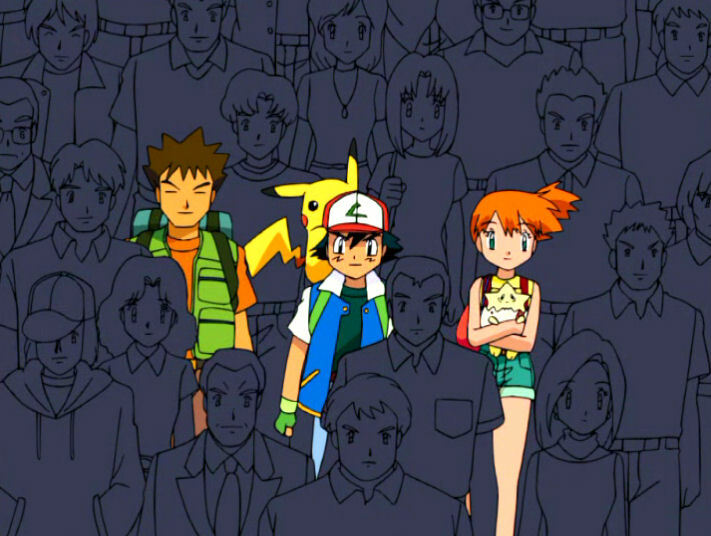 This page is dedicated to those male background characters who keep appearing over and over and over again. 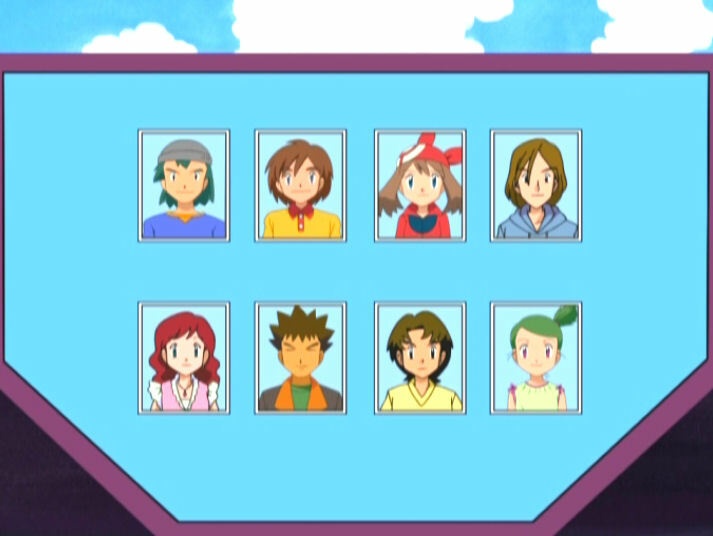 This list only begins to scratch the surface...if you have any more examples, then by all means, e-mail me. 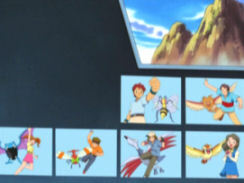 I'll want all the screencaps in this section to be from my DVD's since I don't want to deal with grainy .avi files, so if I don't have the DVD with the episode on it, I'll have to wait until I do before adding them to this list. 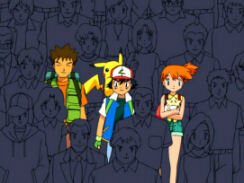 You can click on any image on this page to view a larger version. 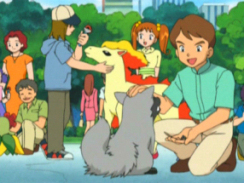 His first appearance is in "Electric Shock Showdown" where we can (barely) see him at the Pokémon Center, taking care of a pokemon that was presumably defeated by Lt. Surge. 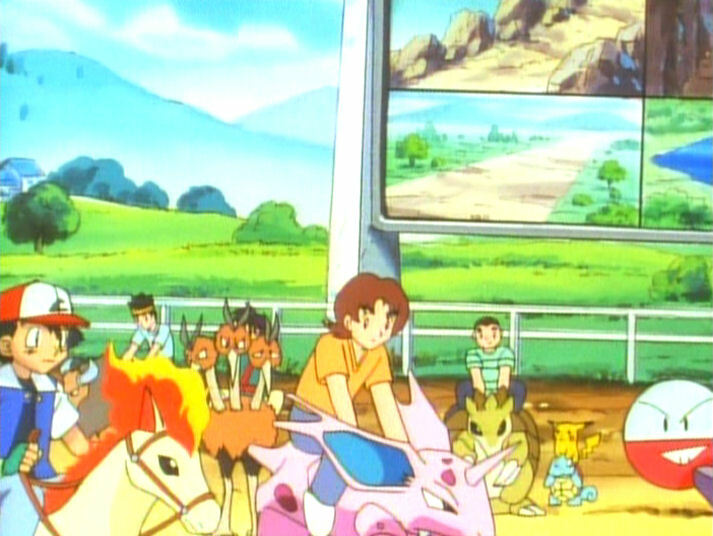 Here he is, on a Nidorino, participating in the Pokemon Race in "The Flame Pokémon-athon!" 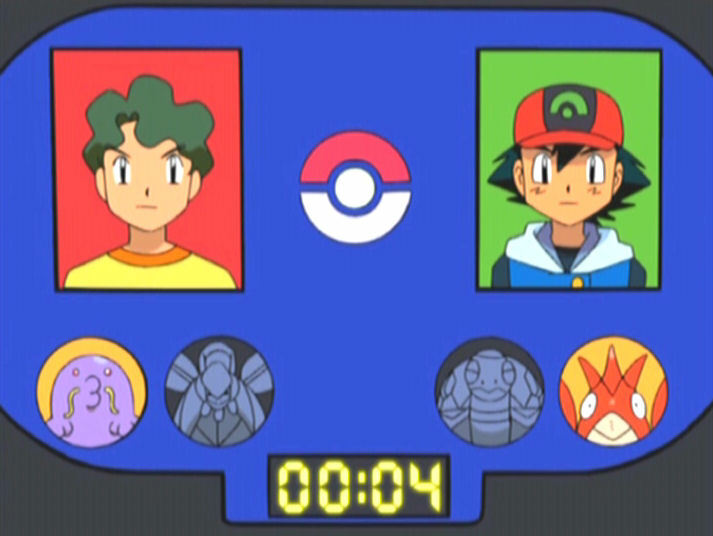 Oddly, in the second half of that same episode, the gender of his pokemon seems to have inexplicably changed. 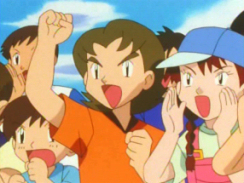 In "The Dunsparce Deception," he compares his Dunsparce to the other kids' pokemon. Later, he shows up as one of the kids in "Will the Real Oak Please Stand Up?" 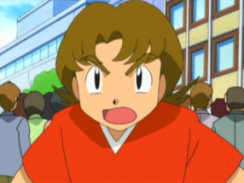 He got himself a new red shirt in "A Double Dilemma." 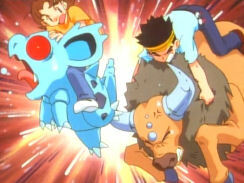 Here he is riding a Gorebyss in "The Evolutionary War." 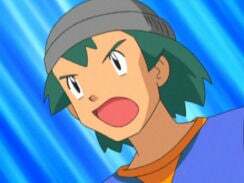 I guess his days as a Norman fan are over. 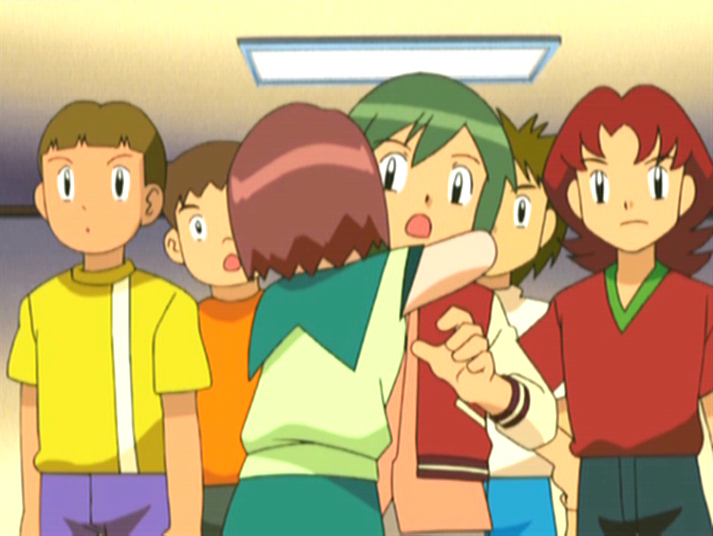 This was taken from "Mean with Envy." I guess he dyed his hair and became a Coordinator? Here he is competing in the Gardenia Town Pokémon Contest in "What I Did For Love!" 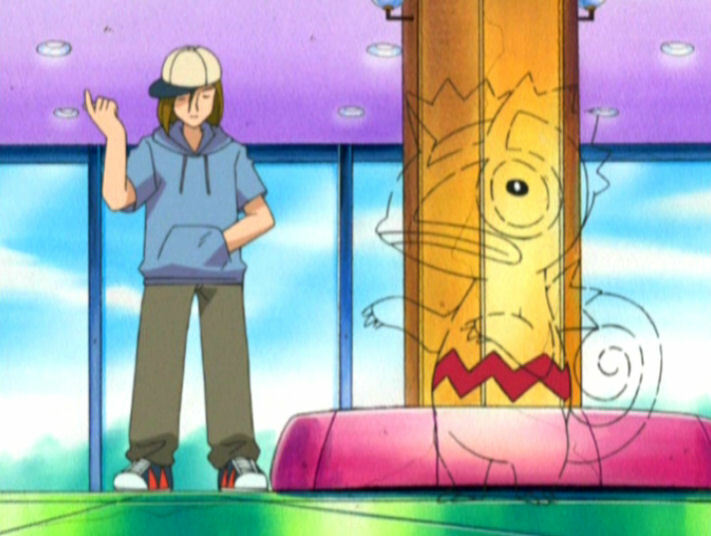 I guess he didn't like his new dye job. 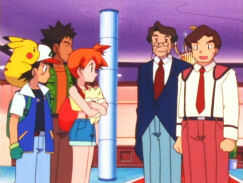 The Gentleman first appears in "Battle Aboard the St. Anne" as the trainer who trades his Raticate with Ash's Butterfree. Later, he appears at the train station in the Battle Frontier episode "A Time-Warp Heals All Wounds!" 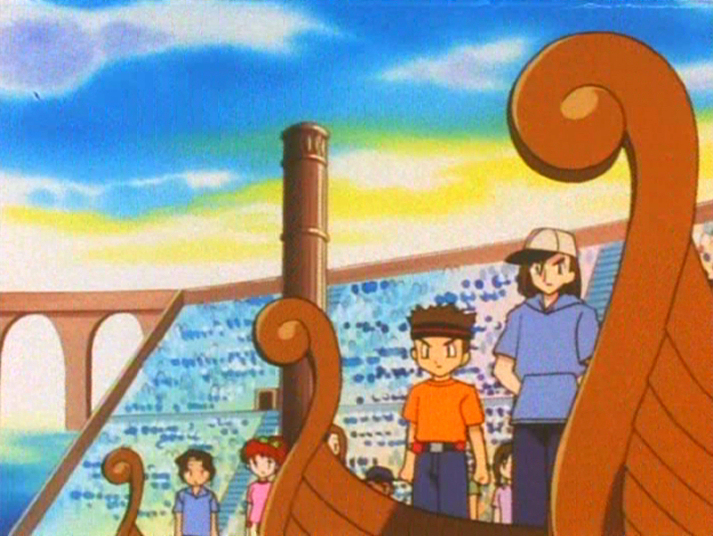 Ash pushes him out of the way in "Battle Aboard the St. Anne" in order to watch the Gentleman fight with his Rattata. 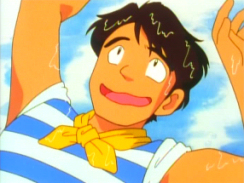 He was apparently able to get off the sinking ship without any problems since he gets to watch the beauty contest in "Beauty and the Beach." 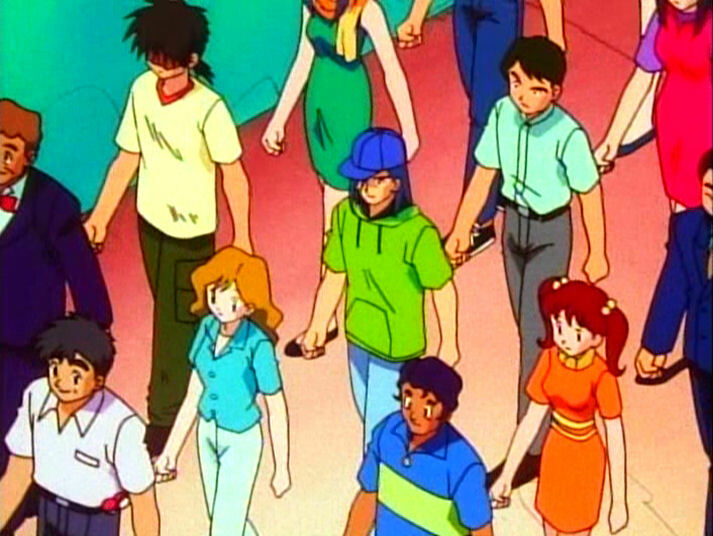 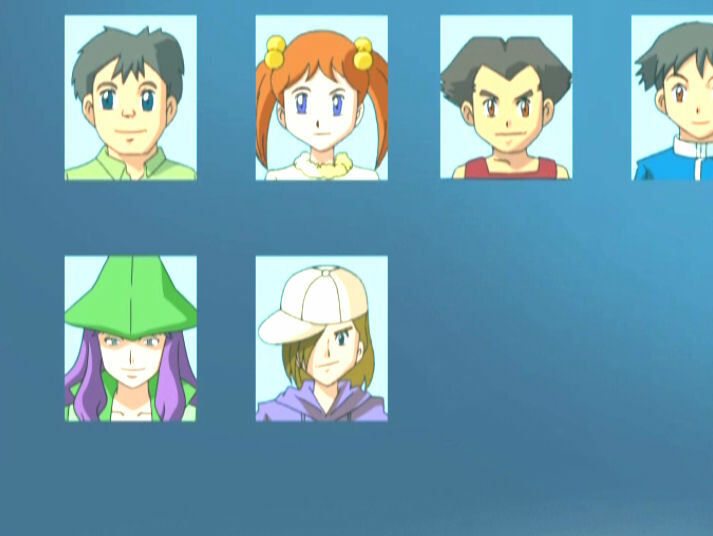 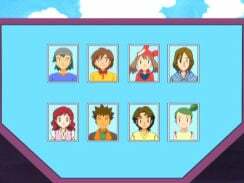 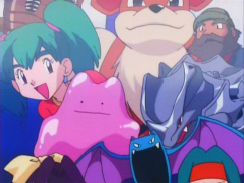 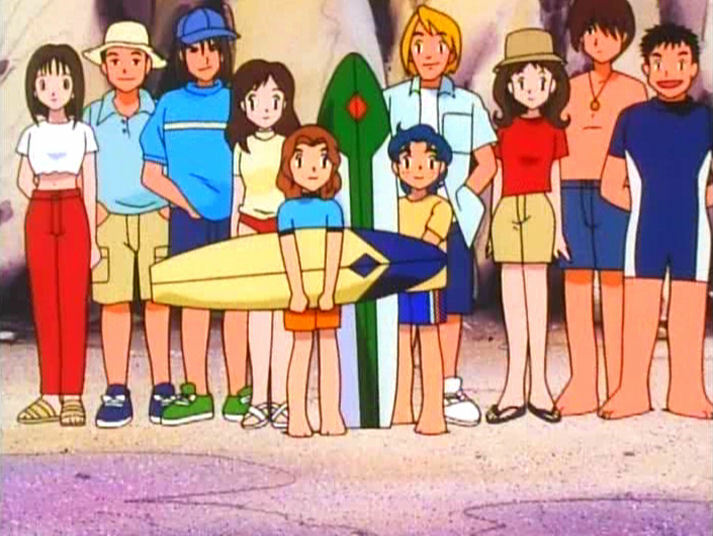 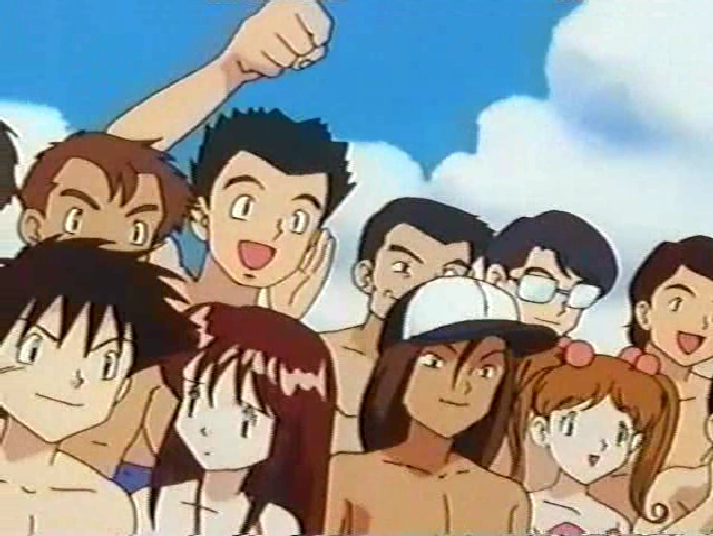 Here, he's gathered with the other trainers who had been summoned to exterminate the Diglett in "Dig Those Diglett!" He's in the crowd watching Victor put the flag on top of the giant rock in "The Pi-Kahuna." 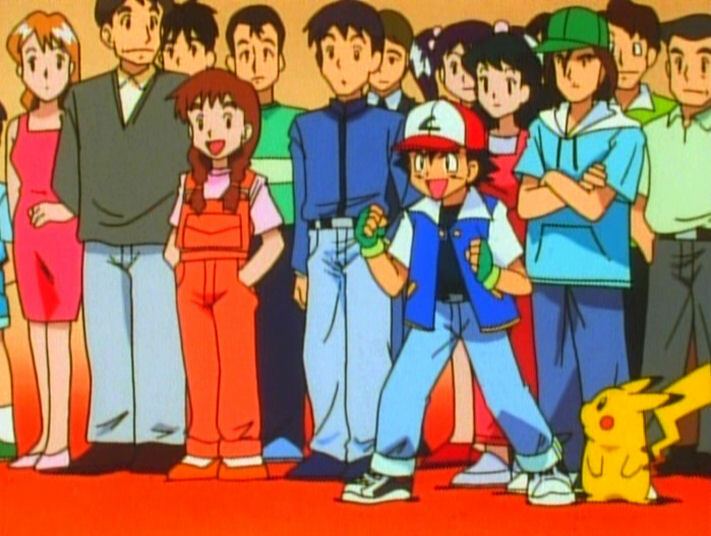 In the first movie, "Mewtwo Strikes Back," he's part of the crowd gathered in the Pokémon Center during the storm. He appears in the Kanto Pokémon League episode "All Fired Up." 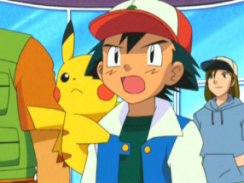 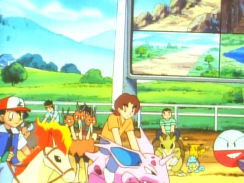 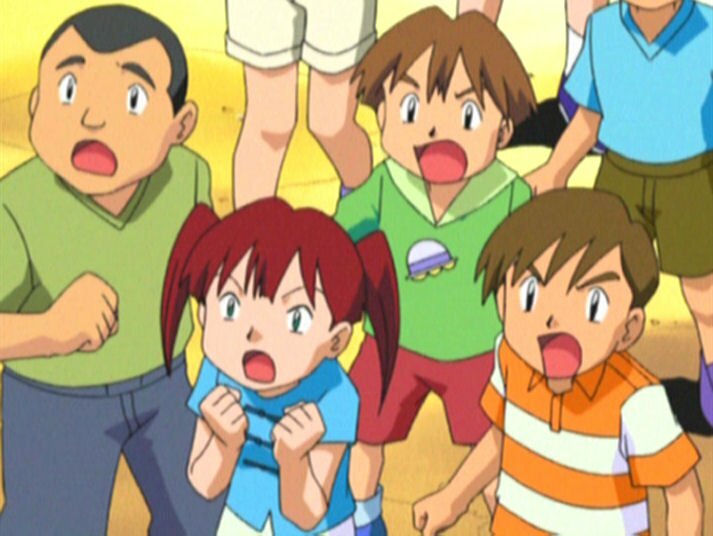 In "Enter the Dragonite," he sits behind Team Rocket as they watch the battle between Ash and Drake. 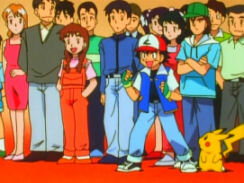 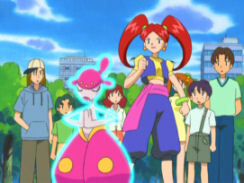 Toward the end of "Mewtwo Returns," he can be seen in the lower left-hand corner of the screen. 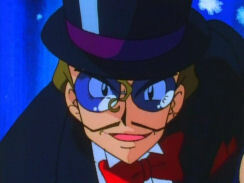 Here he is in the Whirl Cup episode "Dueling Heroes." Later, we see him at the Johto League in the episode "A Claim to Flame." 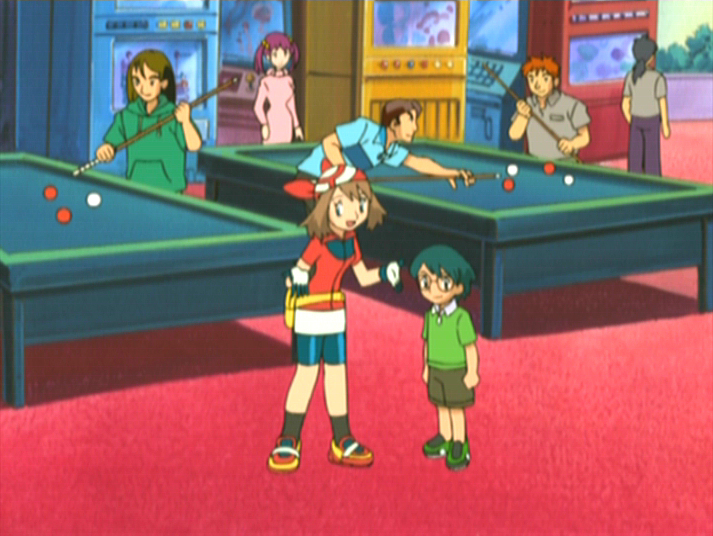 Once our heroes get to the Hoenn region, it seems as if he decided that being a trainer wasn't his thing and wanted to try his hand at being a Coordinator. 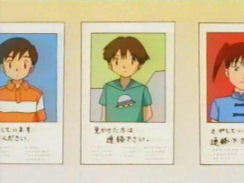 His first appearance is in "All Things Bright and Beautifly," where he's one of the finalists. He apparently has a Kecleon in this scene from "Now That's Flower Power." Here he is again, feeding a Pokéblock to his Ponyta in "Win, Lose or Drew." 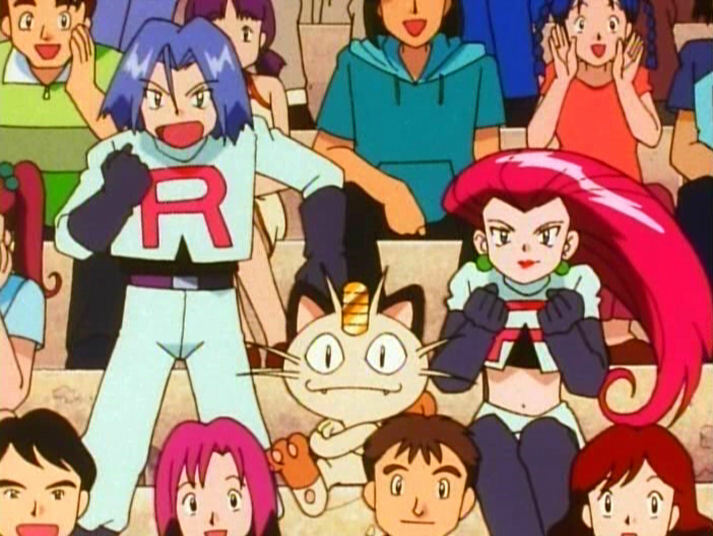 Looks like he wants some of Team Rocket's Gold and Silver Pokéblocks in "Pros and Con Artists." Here he is watching May get the ribbon in "Disguise Da Limit." He and his Skarmory entered the PokéRinger competition in "That's Just Swellow." You can see him playing billiards on the left side of the screen here in "The Ribbon Cup Caper." 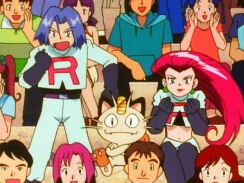 It looks like he got a new shirt, too. 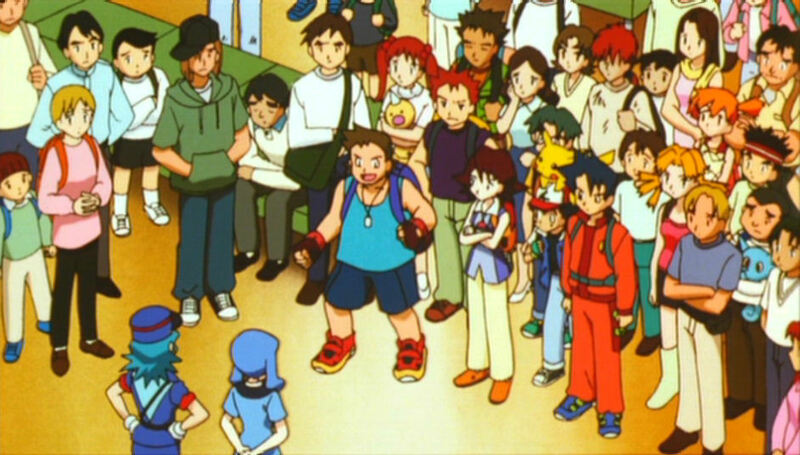 He went back to Kanto and participated in the same Pokémon Contest that Brock entered, sans hat, in "What I Did For Love!" 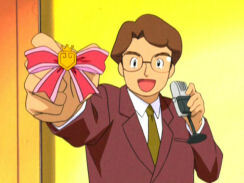 Even though he didn't win the Gardeia Town Contest, it looks like he got enough ribbons to compete in the Kanto Grand Festival . He makes a "blink and you miss it" appearance in "May I Harley Drew'd Ya!" 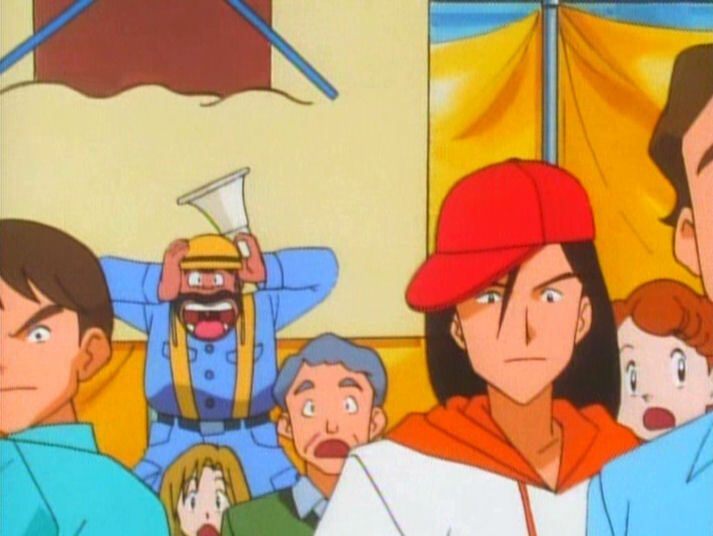 He also shows up in "Not On My Watch Ya Don't!" and "Malice In Wonderland!" 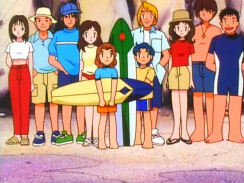 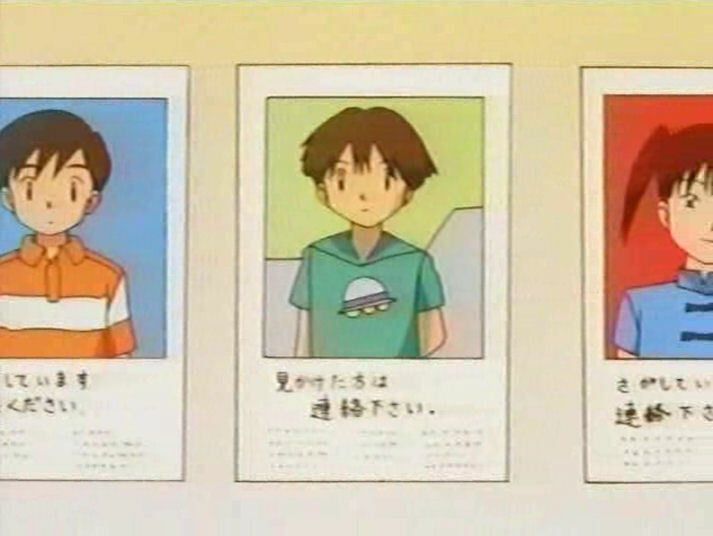 The sailor character first appears in "Tentacool & Tentacruel"...he is rescued by Ash's and Misty's Pokémon. Later, we see a man who looks very much like him in "Mantine Overboard," giving our heroes information about the ferry they just missed. 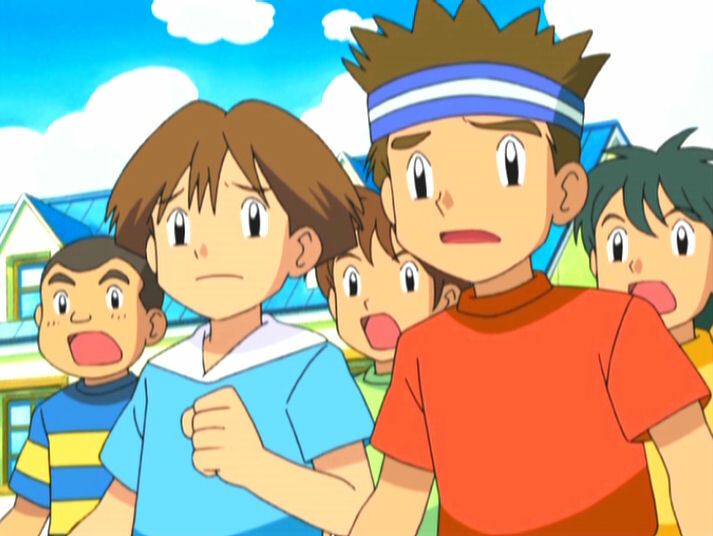 His hankerchief is blue now instead of yellow. 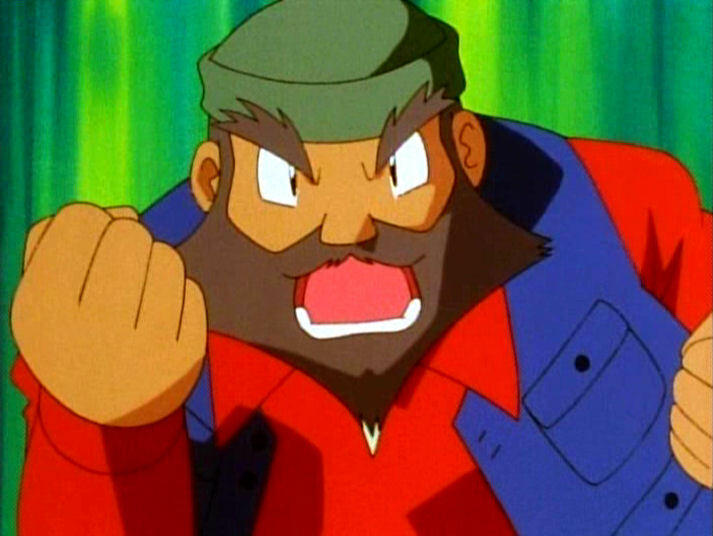 Later on, we see this same man as the "captain" in "Hoenn Alone." He's one of the missing children in "Hypno's Naptime." He shows up again, sans spaceship, in "Doin' What Comes Natu-rally." 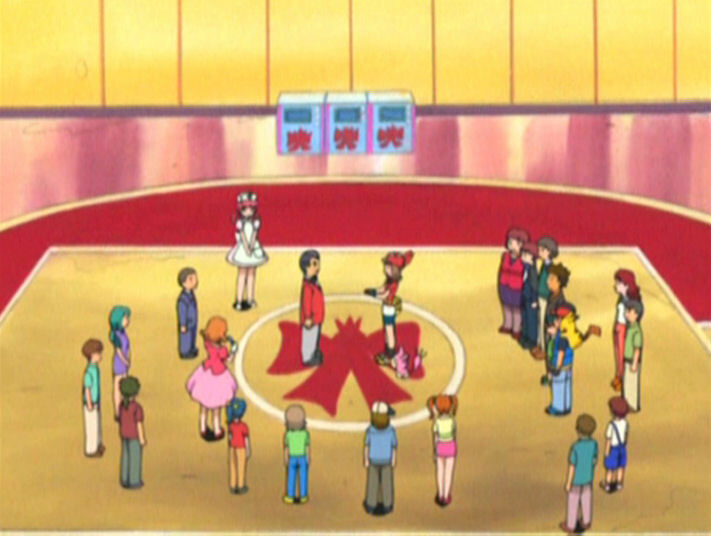 Here is is being conned by Team Rocket in "Hokey Pokéballs." 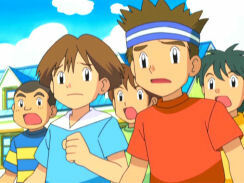 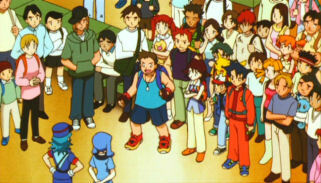 He appears again with the group of kids in Sinnoh in "Once There Were Greenfields!" 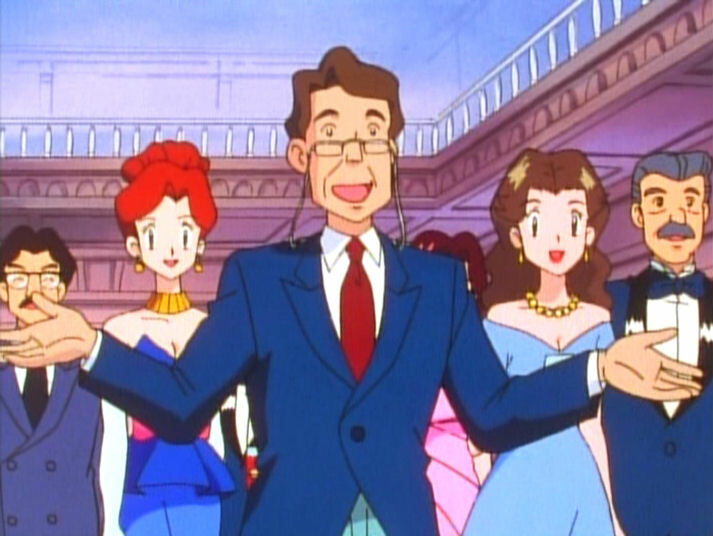 This man appears to be the leader of the Pokémon Lovers Club in "Hypno's Naptime." 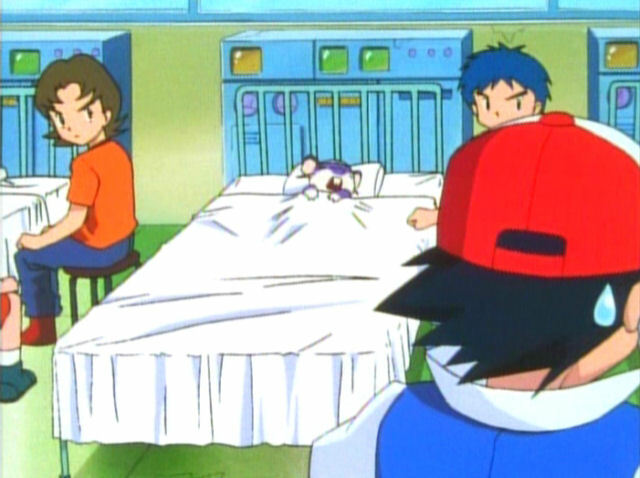 Later, he's one of the victims in "The Kecleon Caper." 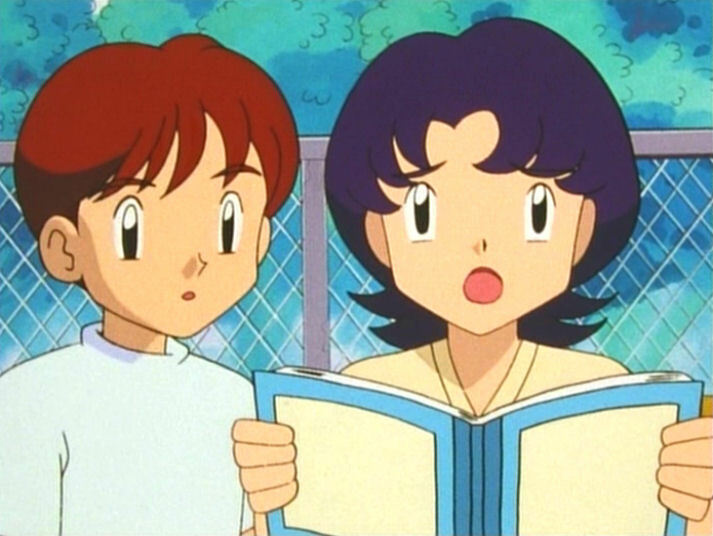 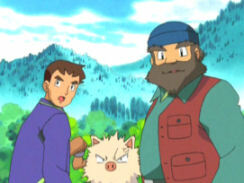 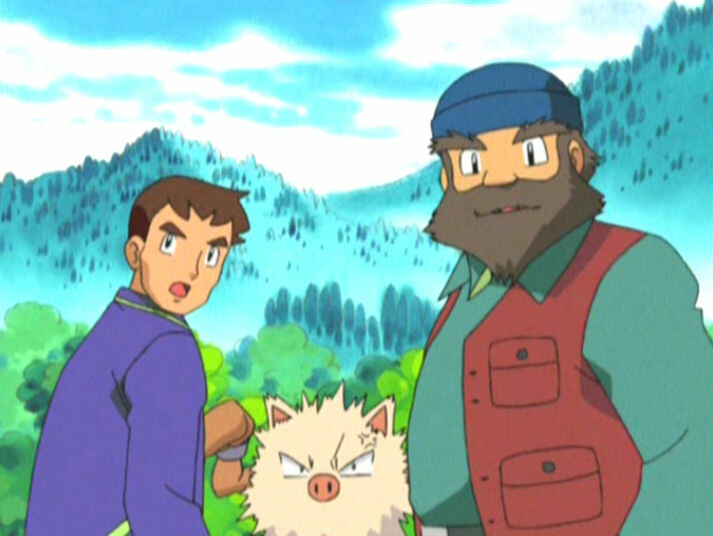 This trainer first appears in "Bulbasaur's Mysterious Garden" as Ash's opponent. He has a Rhyhorn. Here is in during the big pan shot of the second opening, Rival. 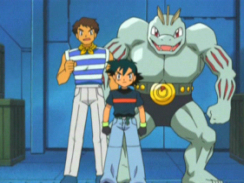 Here he is in "You're A Star, Larvitar," training for the Silver Conference. 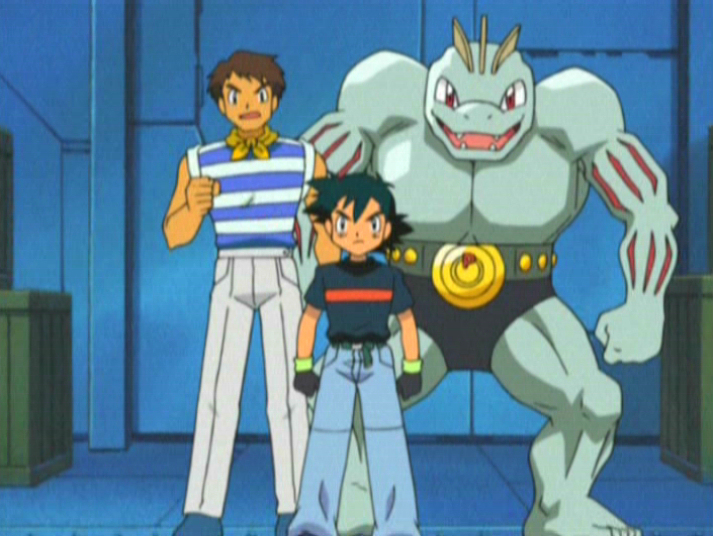 At the end of the episode, we see that he has a Machoke. 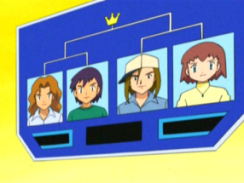 The man first appears in "Princess vs. Princess" as the announcer for the Pokémon Contest. 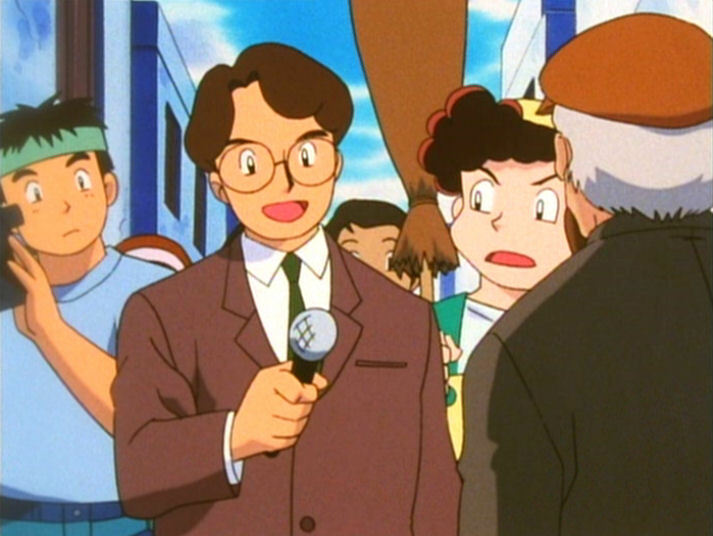 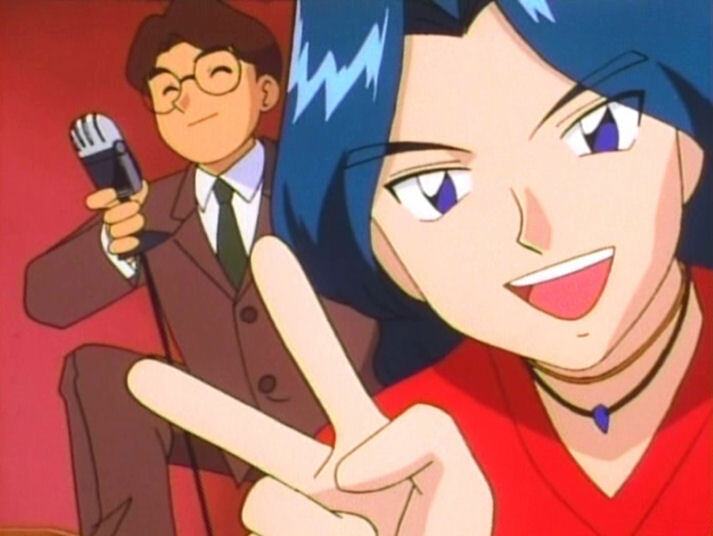 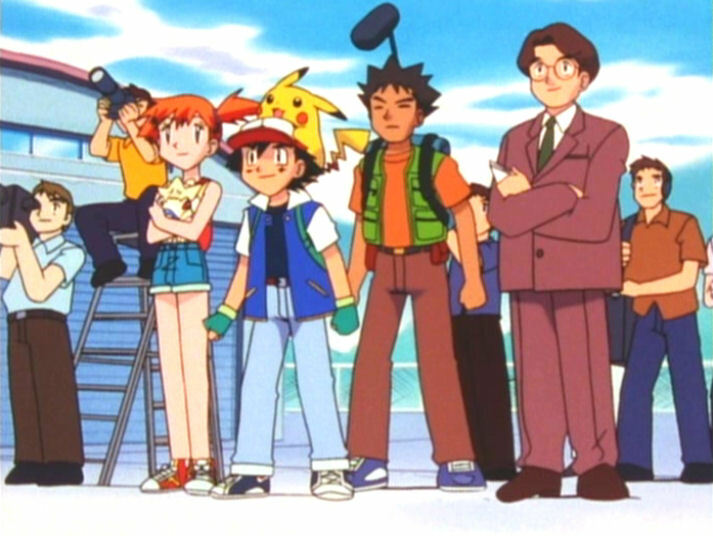 Here he is in the Johto region as a TV reporter in the episode "The Art of Pokémon." 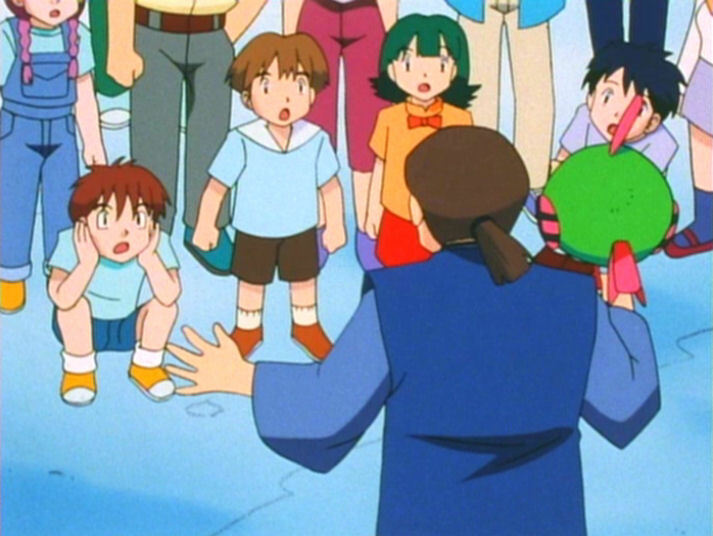 Just a few episodes later, he shows up to tell our heroes about the virtues of the new blimp in "The Kecleon Caper." In Pokémon Advance, he shows up in the series' first "proper" Pokémon Contest as the emcee in the episode "All Things Bright and Beautifly." Vivian would fulfill the emcee duties for every other Houen Pokémon Contest to follow. 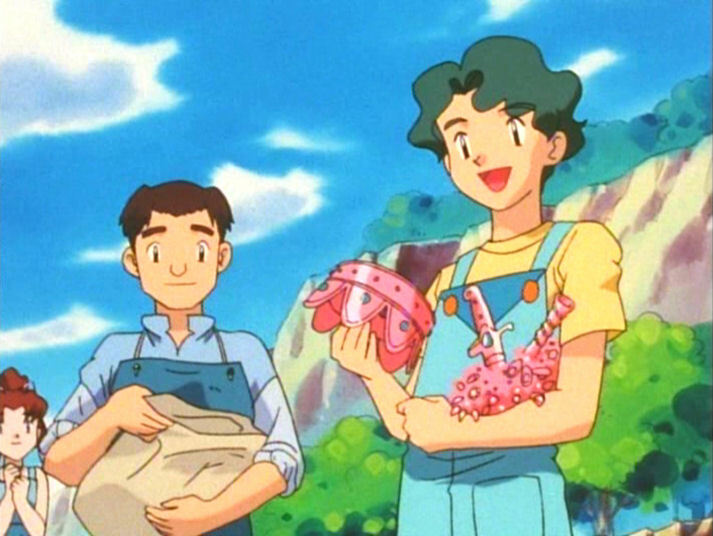 He's the salesman in "The Corsola Caper." 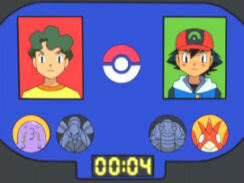 Later, he faces off in the Houen League episode "From Brags to Riches." 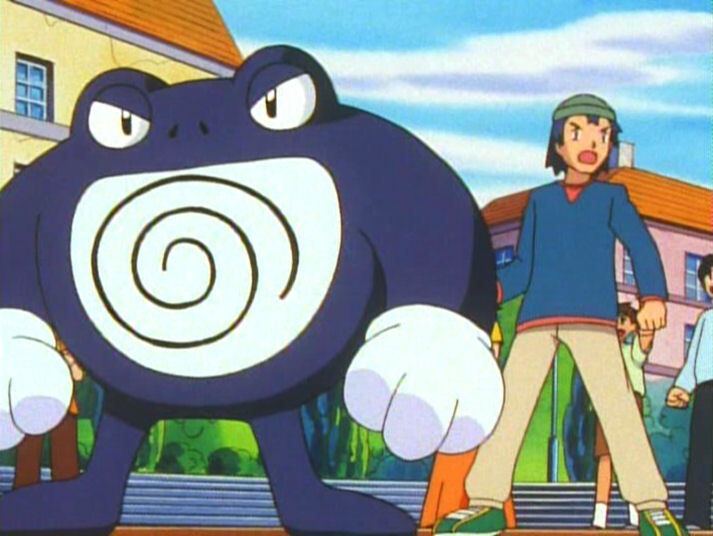 In "Outrageous Fortunes," he's a Poliwrath trainer named Delaney. 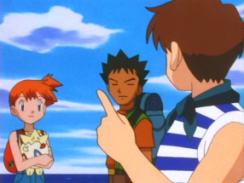 Later, he's renamed Kent in the episode "A Cacturne for the Worse." 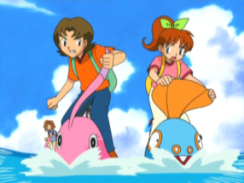 Here, he has a Surskit. 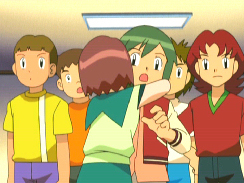 Later, he shows up in the Battle Frontier episode "What I Did For Love!" 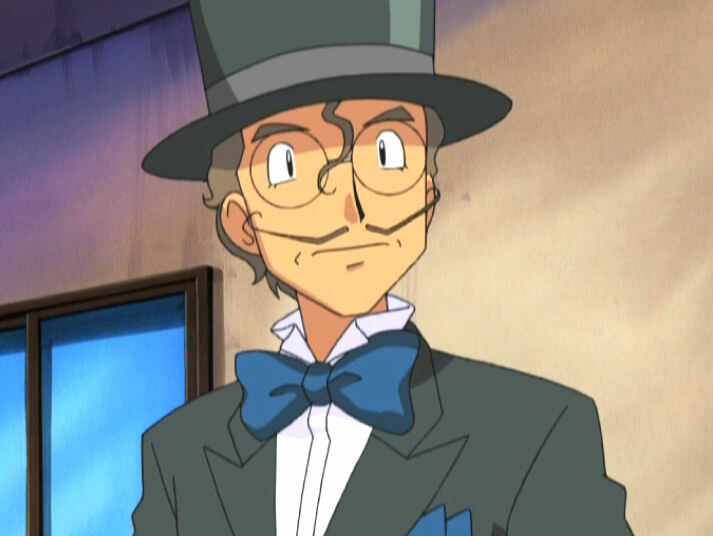 He also shows up in "The Saffron Con."